Why do nightjars come to Sherwood each year? Having successfully completed a 17,000 km migration since they were here last year the nightjars arrive back in Sherwood with the sole purpose of breeding - creating a new generation of nightjars to ensure the survival of their unique genes. They come to places like Sherwood because this habitat provides them with what they need to raise a new brood successfully. Nightjars like areas with small trees and undergrowth in between, they like the ground to be dry, with leaves and stones between which they can site their rudimentary nest. Nightjars are ground nesting birds. They need be able to find suitable places where the nest will not be disturbed so that they can lay their two eggs and raise a new family. They need to be able to find enough food of the right kind for themselves and their chicks. Nightjars require particular kinds of prey and these need to be available in sufficient quantities. Nightjars are generalist insectivores and as such help to control the insect population. Some animals will only thrive on one kind of food, some are less choosy and eat a range of foods. Some change their eating according to the season and what is available. An animal or bird that hunts its living prey. From the point of view of moths, the nightjar is a predator. For more in-depth information on the ecology of the nightjar go to the Science Zone. This page will help you to look at and understand the importance of the nightjar in the Sherwood ecosystem. By doing this we will see the way the lives of the creatures and plants in your local area are interconnected - issues that impact on one creature impact, eventually, on all the inhabitants of the area. It will also show how any changes in the health of the ecosystems where the nightjars winter will have an impact on the health of the Sherwood ecosystem - and visa-versa. 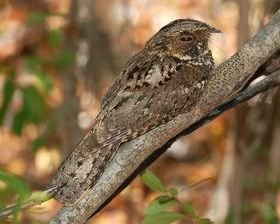 Nightjars, because of their migratory life style, exist within a variety of different habitats in the course of a year. 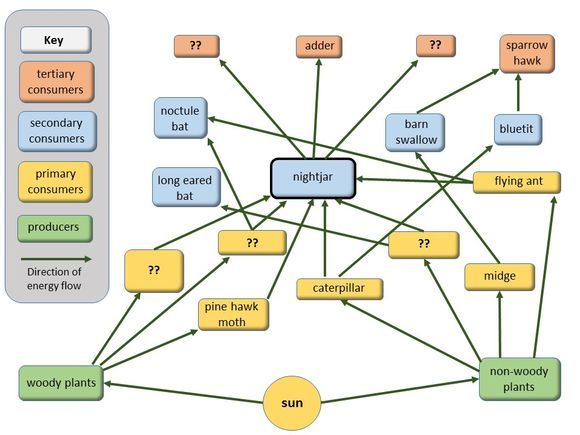 In each of these habitats nightjars have an important function in relation to all the other plants, insects, animals and birds that also live there and this is directly related to their diet as generalist insectivores. What different habitats have you found that the nightjar passes through in the course of a year? The arrows on the diagram show the direction of travel of energy. Starting with the energy from the sun driving the growth of the plants; the plants provide energy for the insects and other herbivores; the insects provide energy for the insectivores and so on up the chain. The animals and birds at the top of the diagram are the 'top predators'; how is the energy that is stored in their bodies recycled and reused? 1. What could happen to the system if the nightjars failed to turn up one year? 3. Can you think about the impact that a very wet summer might have on this system. The diagram above has some gaps in it marked with ?? Download your own copy (use the buttons below) and discuss with your group what might fill these gaps and how you have come up with that suggestion. (there are clues in the Feeding section of the Learning Zone).